Les Jardins Tranquille is a lovely riverside garden in the north of the Dordogne department in the lovely town of Brantome. 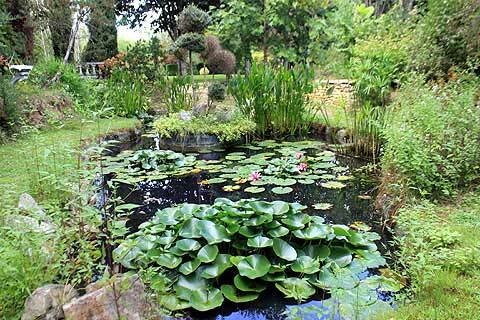 The gardens were once called the Jardin's d'Au delà but changed hands a few years ago. 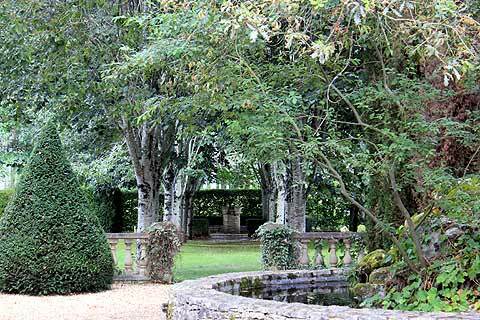 The Jardins Tranquille cover 5 hectares and include English-style borders, natural and formal bonds, a lovely river-side stretch, a woodland area and even a topiary chess set. 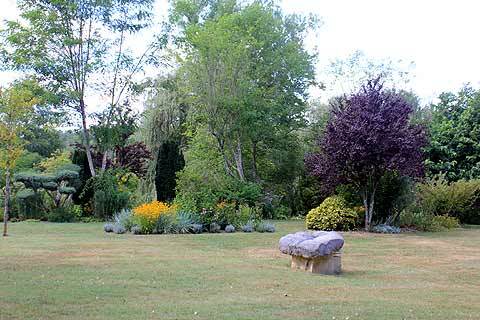 On entering the garden you arrive at an open sunny lawn interspersed with various specimen trees and a number of large borders. 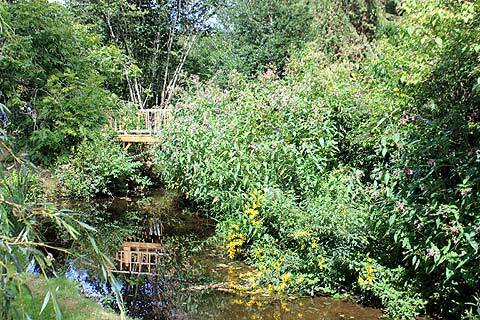 To the left of this area is a stream the edges of which have been attractively planted and you can cross over the stream to an island between the stream and the river Dronne, a lovely spot and nice and cool on a hot summers day. 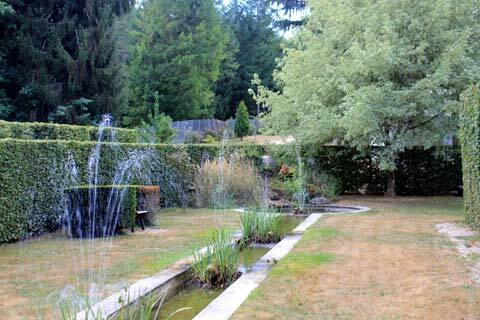 The other side of the garden has a number of smaller gardens within it. There is a formal pool with fountains, a topiary chess set and a natural pool full of water lillies and other pool plants. Another favourite is the tunnel covered in roses, clematis and wisteria. Very pretty and beautifully fragrant too. You will find several peacocks adding to the splendour of the gardens as you explore. A nice shady area in the trees at the far end of the garden offers welcome shade on a hot day and there are various woodland paths to follow. A couple of picnic spots and a refreshments area are also available. As well as being a lovely garden Brantome itself is probably the prettiest town in the Dordogne and definitely is definitely worth a visit. The garden is a lovely bonus to a trip here. Les Jardins Tranquille are open from the 1st May to the 15th of October on Fridays, Saturdays, Sundays and Mondays from 12.00 to 19.00. In June, July and August the gardens are open every afternoon. Entrance: 7 euros for adults; 5-18 years and students 5 euros. Also in Brantome is a lovely little botanique garden - 'le Jardin Botanique d'Alije' - specialising in plants for the potager (vegetable garden) and containing lots of attractive and unusual plants. 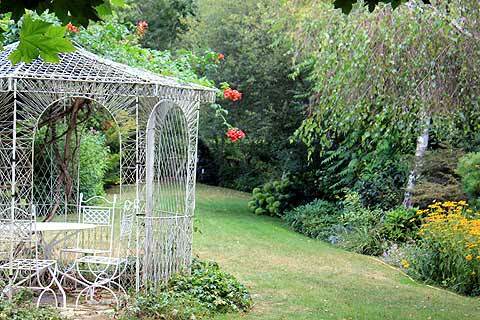 The 'Calebasse et Compagnie' is a small cottage-style garden also in Brantome. So all in all Brantome is a good place for gardens! For a completely different kind of garden visit the Chateau de Hautefort whose impressive gardens include formal parterres and inspiring topiaries.